Wanda Praamsma grew up in the Ottawa valley in Clayton, Ontario. Her poetry has appeared in Ottawater, 17 seconds, and Feathertale, and several literary non-fiction pieces have appeared in the Toronto Star, where she worked for several years as an editor. She has worked, studied, and lived at various points in Salamanca, Spain, Santiago, Chile, and Amsterdam, The Netherlands, and has travelled to many places in between and beyond, including Cuba, India, and the Balkans. Praamsma currently lives in Kingston, Ontario, and is working on an MFA in Creative Writing through the University of British Columbia. 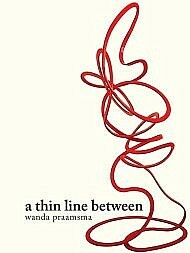 a thin line between is her first book of poetry. Find Praamsma at www.whywandawrites. com, or connect with her on Facebook https://www.facebook.com/wpraamsma.